Co-Optimus - News - Pit People Closed Beta Registrations are Open! In case you've been wondering what Pit People are and exactly how a turn-based co-op adventure works, now might be your chance. Developer The Behemoth has opened up registrations for the closed beta of its fourth game. If you've got an Xbox One, get to gettin'! Signing up for the closed beta requires a little more than clicking a button. First you have to look through the terms and conditions, then register on the Behemoth forums. Once that's complete, click the Beta Registration button, fill everything out, and you're done. The testing is set to begin sometime in August. No word on when or if PC users will get the same options. 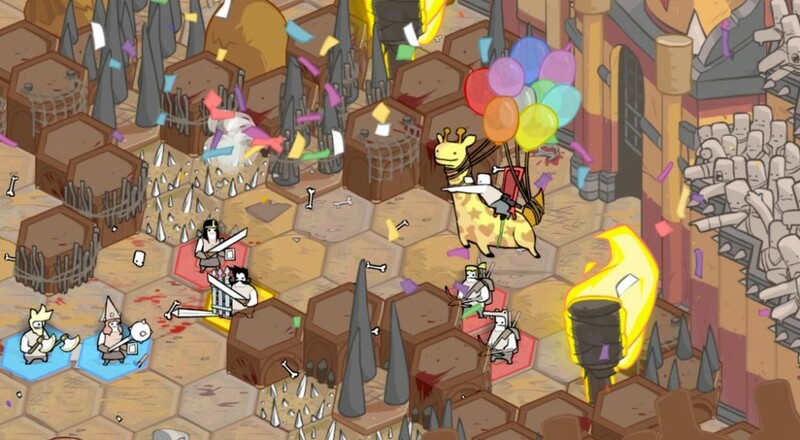 Pit People drops you into an arena and gives you a chance to fight for your virtual life. A giant six legged space bear fell and shattered the planet, leaving the place an awful mess for survivors Horatio, Pipistrella, Yosef, Sofia, and Gluten. Equip your icing launcher and explore strange locations with your co-op pal, all in a turn-based strategy setting littered with trademark The Behemoth humor. Pit People's sugar coated mega-violence is still in development with no release date announced, though it's been promised to both Xbox One and PC players.